The original Splatters was a strange and heartening success story. 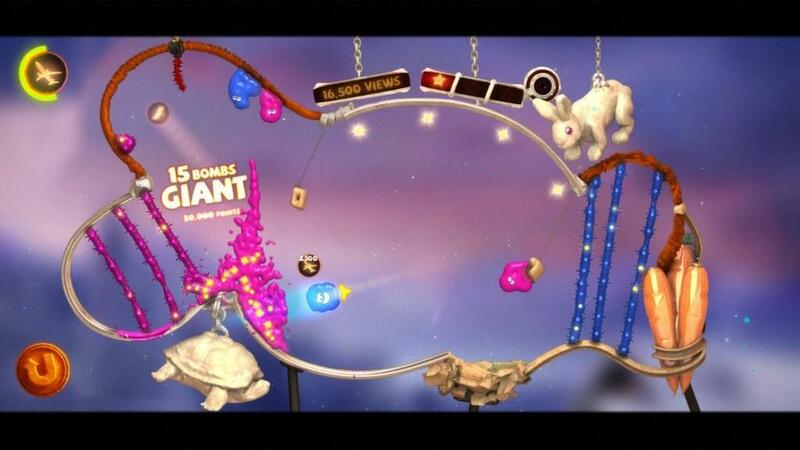 Released last year for Xbox LIVE Arcade, it’s a physics puzzler developed by Israel-based Spikysnail Games. The premise is simple: launch smiling blobs of goop at piles and arrangements of fireworks, using time reversal, gravity assist and level architecture to splatter the blobs all over the fireworks and cause them to explode. 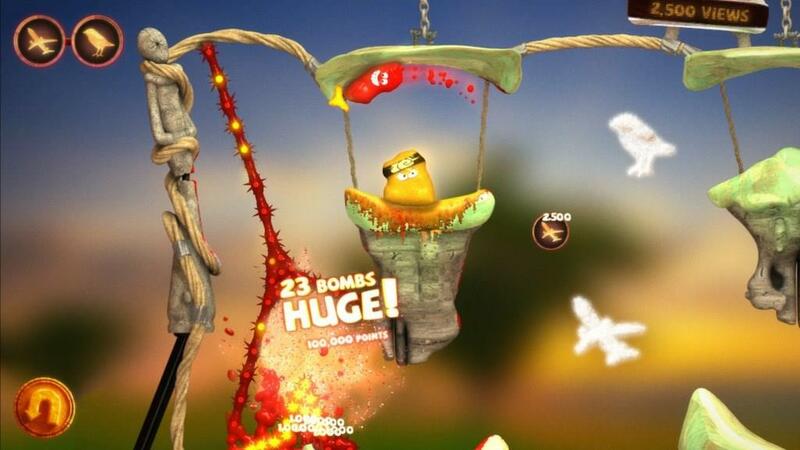 The game itself was great fun, but releasing it on the increasingly indie-hostile XBLA, and at a time when Angry Birds was cheapening the entire physics puzzle genre, was a huge risk. Against the odds, the game was successful enough to get a sequel greenlit, and now Super Splatters is upon us. With a year of experience under their belts and the much friendlier, more flexible Steam platform to release on, Spikysnail has refined its original title into the game it was always meant to be. Super Splatters is very, very similar to its predecessor in many ways but that isn’t a bad thing at all, and the extra time and experience has allowed its developers to give the original formula the polish it really deserves. First of all, I love the title. I’m a '90s kid, so I have a lot of nostalgia for the Super Nintendo era, when everything you loved from the old Nintendo Entertainment System was back, but “super!” and damn right they were going to put that in the title. It’s appropriate then that Super Splatters feels like that same kind of development strategy: bigger, flashier, prettier and with more content, but fundamentally the same game, just how Mario World, Final Fantasy IV and Super Metroid were an evolutionary progression of their predecessors. If you played the first game, everything you know about it is back, but refined. Super Splatters has the same modes, mechanics and theme, but also assumes you’re at least partially familiar with the first game because it introduces several of the more advanced mechanics early on. This time, however, there is a lengthy and well-thought-out tutorial that guides you through the basic stunts, moves and controls, which is a great addition because an intuitive tutorial was really the only important element the original game was missing. 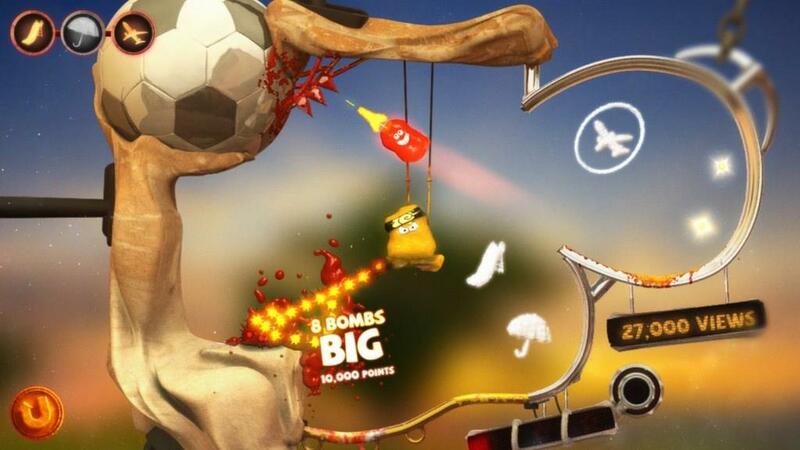 If you hate tutorials, don’t worry too much, as the one in Super Splatters feels very natural. It’s spread over the first several training levels but doesn’t treat the player like an idiot. You’ll be pulling off sick stunts and getting the hang of the relatively simple controls, and the tutorial acts more like guidance and suggestions than a lecture. This is great because most tutorials, especially in puzzle games, typically act as barriers to entry, forcing you to memorize and repeat basic tasks before they let you cut loose in the main game. The tutorial in Super Splatters gives you hints and explains the game structure, but as long as you can beat the level you are currently on, how you do it doesn’t matter. This is especially important in the freestyle levels, which let you fling your oozes around at will and in any order, allowing you to develop your own strategy to tackle the level. This gets the often game-killing trial and error aspect out of the way early and also lets you develop your own style, which is important in Super Splatters because this game is very much about putting on a performance. While the first game definitely carried the theme of live performance art, in the sequel, that theme is taken to its logical conclusion: splattering is apparently a national spectator sport for the little lumps of goo, with cheering audiences watching every performance and with scores tallied as if it were a game show. The score system is broken up into three categories: viewership, star rating and trophies. Viewership is the overall score: how many fans showed up to watch your performance. The star rating is based on specific score and combo goals for each level, with a possible three starts available for every map. 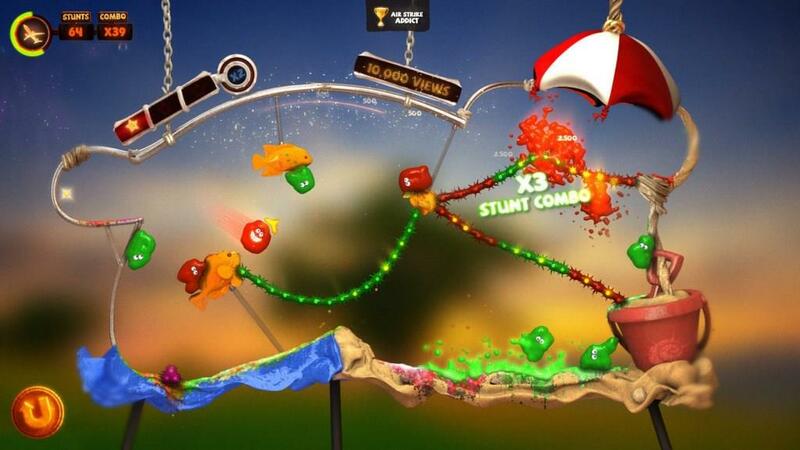 There are also three trophies as well, which are earned for harder requirements, like beating a level in one try, under a certain time limit, or performing a specific order of stunts. 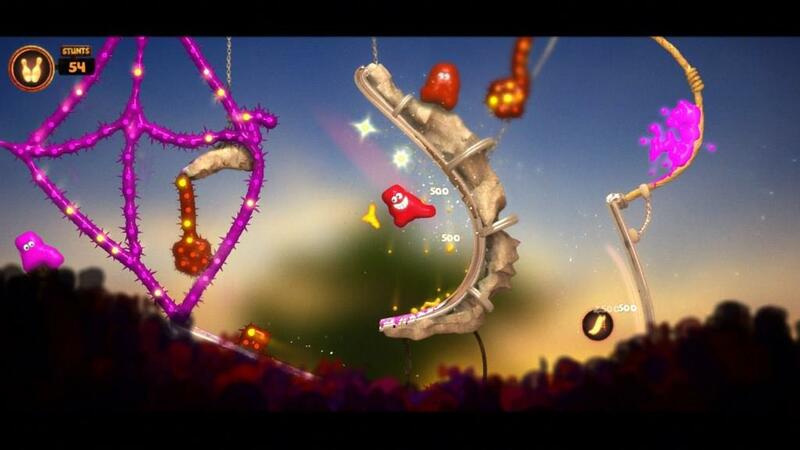 You’ll accomplish the score requirements with many of the same tricks you used in the first game. You can still hit ramps and careen around a map, stop in mid-air and change direction, and wind time back and forth to pull off a super elaborate stunt or shower the greatest surface area possible with splatter goop. This may seem like a pretty basic setup and not that huge of an expansion from the first game, but once again it’s what Spikysnail does with the basics that matters. The map variety is a lot wider this time which allows for some truly daunting, and amusing, firework arrangements. Don’t be surprised if you use up half of your splatters just to knock down all the fireworks and consolidate them into a manageable pile. In addition to the main game, the combo-nation mode makes a return and challenges you to pile up those combos into insane sequences of stunts and explosions. The real breakout this time, however, is Splatters TV. Ostensibly the ESPN of the splatters world, it’s really a way for players to post their craziest replays and show off to the community. It might be great for bragging rights, but I also found it useful to discover creative ways to get past difficult levels, similar to the ubiquitous Let’s Plays you’ll find all over YouTube. It’s a fantastic addition to the game that emphasizes the classic community rivalry-cooperation dynamic that has always run through the arcade subculture. Once again, however, watching a tutorial doesn’t make you feel like you are cheating at the game, avoiding classic “puzzle game guilt.” As much as ever, the Splatters series is about nailing the timing and technique of a stunt as much as figuring out the puzzle logistics of a map. Even if you know what to do, you still need the skill and reflexes to make it happen and, more importantly, make it look good. This is so much more satisfying than idly flinging scowling, fat little birds at houses until you manage, by random luck, to hit the wall at the spot and angle that makes Isaac Newton happy. Super Splatters also tunes things up in the art and sound departments without making any drastic, unnecessary changes. The game still has that delightfully foreign sense of humor that made the original so infectious. The aforementioned live performance theme makes the game feel much bigger and more immediate, with a cheering audience always a few feet behind the screen, ready to go wild as you pull off that grand stunt. It reminded me a bit of the gasps, claps and raucous cheers you hear in Super Smash Bros. after a particularly desperate save or brutal K.O. The first Splatters had perfectly suitable production values but Super Splatters makes the puzzles that more edge-of-your-seat because you feel like you have a real audience, and with Splatters TV that’s actually kind of true. In the end, Super Splatters isn’t a groundbreaking change to the original game, but it is everything I wanted out of a sequel. Better levels, a bigger sense of scale and a few great new additions like Splatters TV make this one of the best puzzle sequels I’ve played in a long time. It’s great to finally have the Splatters series on Steam too, and at only $10 it’s a steal. I’m simultaneously hoping and dreading that Spikysnail puts Super Splatters on Android devices, because while I’d love to have the game on my phone I know I’d never get anything else done. Like Tetris, Peggle and Bejeweled before it, Super Splatters is a puzzler you just can’t put down. You could toss chubby, pissed off avians at pig houses, but why not play something with a little more personality and depth? 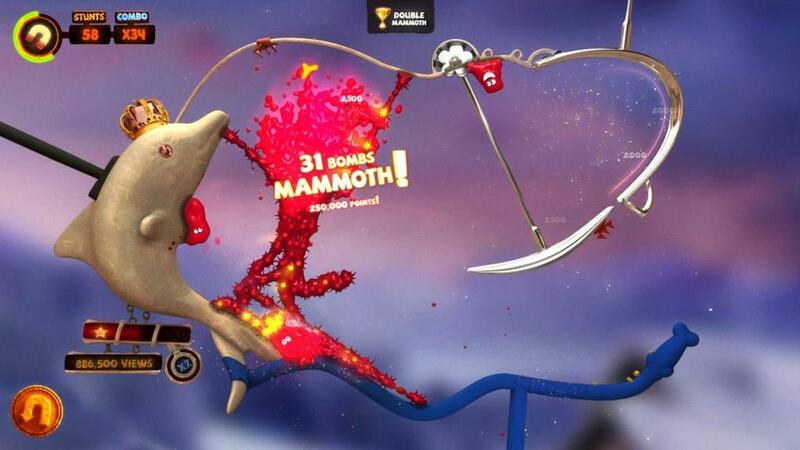 With Super Splatters, Spikysnail proves they are an indie studio worth supporting. You'll get a ton of creative puzzles, challenges and addictive physics-flinging for your $10. 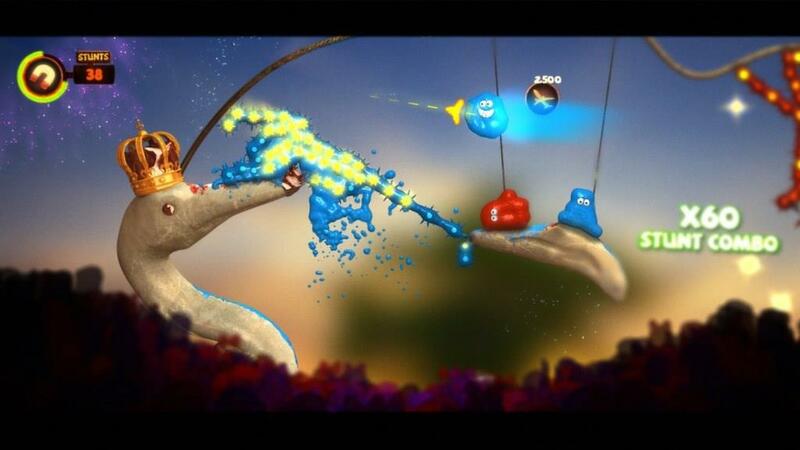 Super Splatters is one puzzler you'll want to get hooked on.